Catch December’s birthstone while you can: soon all the world’s mined tanzanite will run out, leaving only heritage jewels available. This so-called “one generational” gem is so rare that supplies will probably be exhausted in the next 20 years, starting with the most exquisitely hued violet specimens which are seeing tremendous demand as reserves become depleted. Yet it is still possible—just—to find beautiful tanzanite that will form the centrepiece of any impeccable jewellery collection. Whereas the myths of most precious stones date back to antiquity, evoking tales of the gods and ancient lores of healing and strengthening powers, the relative modernity of tanzanite means it does not possess such legend. Discovered little more than 50 years ago in the region around Mount Kilimanjaro in northern Tanzania, its power lies in its rarity, and the allegory that surrounds it has come from a wholly contemporary approach. 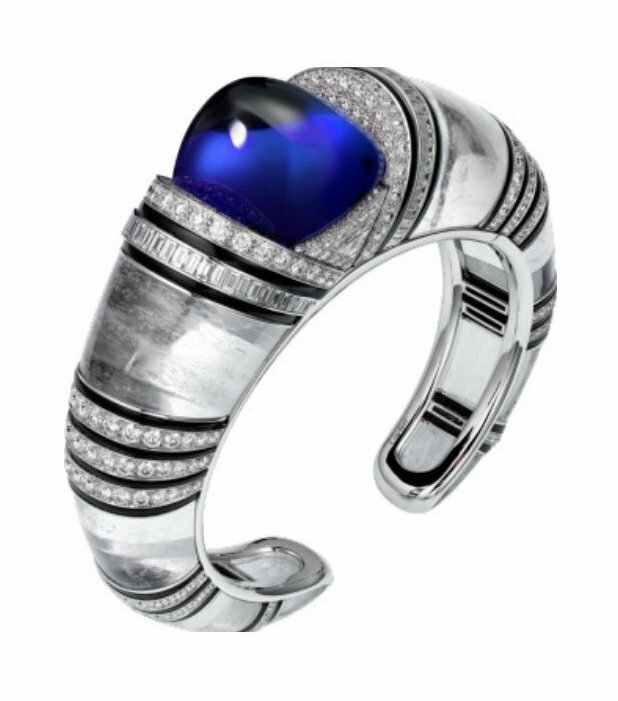 On its discovery in the hills of Merelani by a Masai tribesman, New York jeweller Tiffany & Co. took it upon itself to teach the world about tanzanite in a commercial campaign to prepare it for sale in 1968. 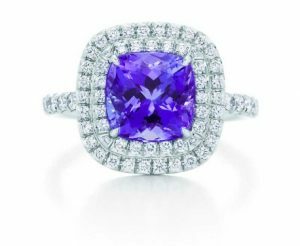 In fact it was Tiffany that gave the stone its name, believing “tanzanite” was more market friendly than its scientific name, “blue-violet zoisite”. The retailer believed the new moniker would stimulate consumer interest and invoke images of its birthplace in a mysterious land far away. Yet it does not symbolise intelligence, clarity and spiritual awareness, like opal is believed to. And contrary to the legends behind topaz, it does not increase strength and make the wearer invisible. Instead, its dazzling beauty and outright rarity speak for tanzanite, which is all the more appealing due to the way its crystals show separate blue and violet hues depending on the direction from which it is viewed. Alongside sapphire, tanzanite is the most sought-after blue stone on the marketplace. Rarer than diamond, tanzanite is a blue and violet variety of the mineral zoisite, a calcium aluminium hydroxyl sorosilicate only found in an area 7 kilometres in length and 2 kilometres across. It forms as a brownish crystal that exhibits remarkably strong trichroicism, meaning it exhibits three colours concurrently. Heating, either occurring naturally underground or in a furnace, removes the brown or burgundy colour component to produce a stronger violet-blue colour. On rare occasions, gem-quality tanzanite will heat to a green primary hue, which is almost always accompanied by blue or violet. These green tanzanites have some meaningful value on the collector’s market but are seldom of interest to commercial buyers. 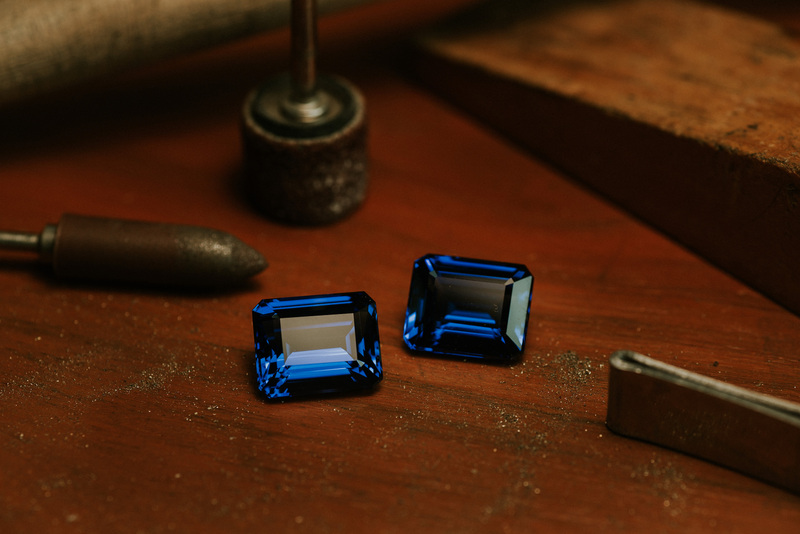 Some stones found close to the surface in the early days following tanzanite’s discovery, in an area now called D Block, were gem-quality blue without the need for heat treatment. This was probably the result of a wild fire in the area which heated the stones underground, and gave rise to the idea that D Block stones were more desirable than tanzanite found in other areas. Most of the important jewellery brands have crafted magnificent pieces using tanzanite over the years, though Tiffany & Co. was the first do so. It promoted the gemstone through advertising that lamented how Tanzanite could only be found in two places in the world: in Tanzania and in Tiffany’s. Henry Platt, the retailer’s president at the time, and great-grandson of Louis Comfort Tiffany, would call the gem “the most beautiful blue stone to be discovered in nearly 2000 years”. Few experts are inclined to think differently, half a century after the first stone was mined. Part of Cartier’s Royal Collection, this white gold bracelet is studded with baguette-cut, triangular-shaped and brilliant cut diamonds, rock crystal and onyx. At its center is a 79.52-ct cabochon-cut cushion-shaped tanzanite from Tanzania. This platinum ring features a cushion-cut 2-ct tanzanite and a double row of round brilliant diamonds of a total weight of 0.45-ct. This rose-shaped necklace takes inspiration from the Italian gardens of the Renaissance period. Art and nature are celebrated with a detachable rose pendant — this doubles up as a brooch — that features multicoloured petals surrounding a large 14.43-ct cushion tanzanite at its heart. 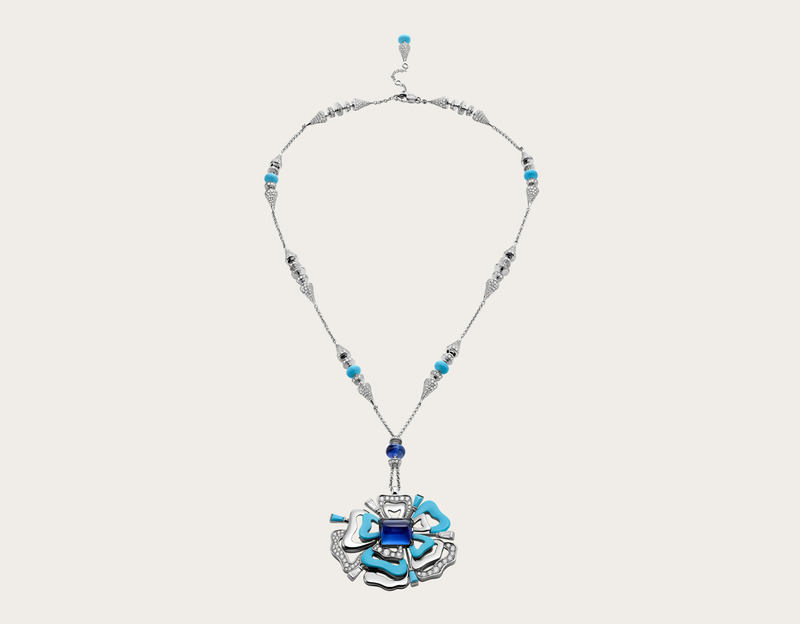 The necklace is made up of 12 turquoise beads, one tanzanite bead, and three tapered step cut diamonds and pavé diamonds in 11.82-ct.